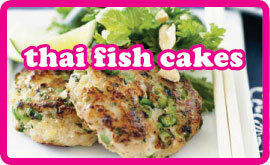 I can’t quite explain how delicious Thai fish cakes are. They’re one of those foods that once you start, you can’t stop eating. They’re small enough for you to convince yourself that one more won’t hurt. Before you know where you are, you’ve been tempted to eat your own body weight in them. This recipe makes 30 of the delicious little fried treats. I made myself divide the mix into 3 and freeze 2 portions to kill that temptation. They’re really easy to make incidentally. Remove any skin and bones from the fish fillets and add to a food processor. Blend the fish till smooth. You can use a hand blender too. Add the curry paste, fish sauce and egg and blend again, briefly till smooth. Add to a large bowl and add the lime leaves, coriander and beans and combine well. Add a little salt and stir. NOTE: You can freeze the mixture at this point and use as and when. Heat about 5cm of peanut oil in a pan and when hot take 1 tablespoon of the fish mixture and shape with wet hands into a flatish pattie. Drop into the oil and fry on both sides until they are golden brown and puffed up. Remove with a slotted spoon and drain on paper towels. Repeat for the remaining mixture. You should get about 30. Serve hot with sweet chilli dipping sauce or simply: Mix together 1/2 cup light soy sauce with 1/2 tablespoon fish sauce, 1/2 teaspoon sugar and 2 teaspoons lime juice. This will make more than you need for this recipe. But you can freeze this for up to 3 months or use it for a red curry.